With summer drawing to a close and the little ones returning to school, homeowners throughout Kansas City know that cooler weather is on the way. This comes with all manner of concerns, not least of which is how to keep your lawn alive during the winter months. Fortunately, one of the best ways to keep your yard in top condition throughout the year is readily available through SYNLawn Kansas City. We offer the most realistic artificial turf available in Kansas City, making it the perfect choice for this back to school season. 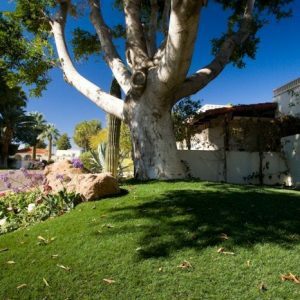 Reduce your workload and expenses with synthetic turf! Whether you want to throw a Back to School party for the kids or just want to make a smart investment for your home, synthetic grass is the way to go. With a new school year starting up, kids have plenty of pent-up energy they need to release, so make sure they have a safe area to play. We have designed our artificial grass to not only stand up to the rigors of the rough and tumble play of children and pets, but also to be soft enough to help protect them against any potential falling injuries. This makes it the ideal surface for backyard games, parties, barbecues, and any other kind of gathering you can think of. Not only is artificial grass safe and durable, it is also easy to clean. You will never have to worry about spills leaving unsightly stains. That also means that synthetic grass is a great option for Kansas City pet owners, as it is easy to clean up after your four-legged friends. With the cooler weather approaching and winter just around the corner, many homeowners worry about how to keep their lawns alive through the season. Those who have artificial grass installed in Kansas City don’t have to worry about ugly brown patches when the spring returns; their lawns will stay green through even the most extreme cold. Imagine all the time and money you could save simply by installing synthetic turf at your home. Say goodbye to expensive monthly water bills, lawnmowers and mud as you say hello to more money and free time to enjoy the things that matter most. Contact us today to set up a free design consultation!